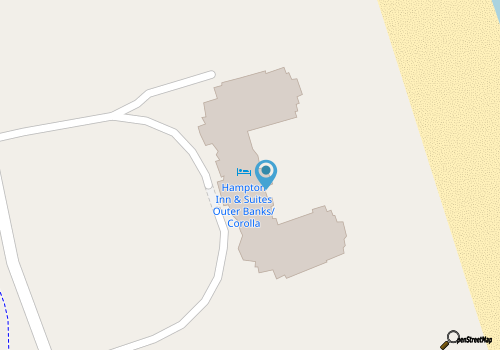 Hampton Inn & Suites is a beautifully situated hotel in the heart of Corolla that features an array of resort-quality amenities that are designed for guests to fully ease into the OBX vacation lifestyle. Close to the Currituck Club golf course, the Pine Island Audubon Sanctuary and Center, and even the Currituck Lighthouse, guests will be close to all the cool Northern Outer Banks attractions, but will also find plenty of ways to have fun without leaving the hotel’s perfectly manicured grounds. There’s a wealth of amenities found on-site, including an indoor pool, three seasonally opened outdoor pools, and private beach access that leads to a quiet stretch of Corolla shoreline. There’s also four meeting rooms and a business center for working vacationers, as well as a free daily hot breakfast with complimentary breakfast bags to go on the weekdays. The rooms at the Hampton Inn are equally inviting, and feature flat screen TVs, microwaves, full and lap desks, free Wi-Fi, and mini-fridges, microwaves and coffee makers. Suites are also available, which include kitchenettes and sofa beds for extra guests, and all visitors will be just steps away from that renowned ocean shoreline. Comfortable with shades of luxury, the Hampton Inn & Suites Corolla is a full resort for visitors who want to discover the pristine northern regions of the OBX.